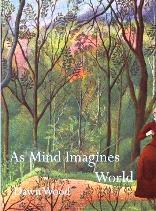 A process of renewal through imagination is the thread that runs through Dawn Wood’s new collection of poems, As Mind Imagines World. From different angles that encompass dreams, recollections of the past and graphic novels, imagination reveals a healing power that helps overcome frustration, disillusionment and grief, and reinvents life. The trigger of this new beginning is not ‘emotion recollected in tranquillity’ but it is ‘a good storm’ or ‘a vast desert,/ mesmerising in its nothingness’, where the intercessor to the other world is ‘a monstrous,/ re-winged cherub’(‘I Wish You a Good Storm’). It is not a peaceful process but a torrent that ‘sweep[s] you downstream…nurtured by hailstones and kindling brimstone’. It is a tempest that sweeps your life away and inevitably changes it, hopefully for the better. It seems that without its subversive, disruptive force it is impossible to be renewed. It personifies the energy of the poetic language that Wood moulds to create fresh imagery and unexpected perspectives. Imagination flares in ‘Epiphany’, the poem that introduces the collection. This is an eruption of images starting from an ordinary village square with fountains ‘and a café-bar closed for the season’. Then the lyric voice invites the reader to imagine new dimensions ‘where the Christmas tree’s crocheted’, where the ‘sugar in cafés delivers a sermon’ and where ‘you’d see pomegranates the birds have ripped open,/ fennel umbellifers, empty of seed, and wild narcissi’. The mind traverses an almost unknown path, with unpredictable turnings, connecting different countries, different times and different stories in which love encounters betrayal and hope can end in disillusionment. Nevertheless, life goes on. For this reason, the Old Roman Road is ‘resurfaced’ by the farmer who owns the land, and he uses ‘a slat to indent grooves / on corners so his vehicles will not slip’. It is a metaphor that suggests how to deal with the unpredictable side of life. ‘Epiphany’ ends with an invitation to enter the world of imagination and be carried away to places the poet means to explore. A compelling analysis of the parable of death appears in ‘A Certain Weight’ which describes the attempted rescue of a dying kingfisher ‘outside Dundee’s H&M’. It is a natural incident, yet also unexpected considering the perfect beauty of the bird’s iridescent colours, its body still warm and faintly breathing. The poem reflects on the ruthlessness of death, an unavoidable presence in the universe – acknowledged but not totally accepted. This does not lead to a definite solution but admits different reactions in different moments of life in a ‘figleaf universe’ that seems to cover rather than reveal. However, forgiveness is a necessary stage in the process of renewal where imagination plays a major healing role in the recollection of memories, discarding the obsolete ones like ‘dollies dresses’, and making room for the creation of alternative visions. it is a game – Joy! Happiness! In spite of the temporary instability, the positive ending brings joy and renewal provided that ‘you do as Daddy taught you – /you wade out and you swim in’. Imagination is once more highlighted in the incredible creativity of the puffer fish described in ‘Bright Creatures’. He is ‘nature’s greatest artist’ according to David Attenborough in a BBC programme. The fish works relentlessly, ploughing the sand for days to create a sort of den to attract the female. It is a sand sculpture reminiscent of a mandala decorated with shells the fish arranges around the edge with its mouth. It is a hymn to life and to love, patiently developed using ‘unstill,/unstable’ sand; and yet it is valuable in its extraordinary effort and perishable beauty. It is a way to imagine the world through art in conversation with nature, with the ‘bright creatures of the countryside,/ and of the ocean’, of which humans are part. ‘How does it feel?’ Indignified! The heart is won – caesarean. London Grip Poetry Review – Kevin Densley	Charles Dickens Museum. Review by Barbara Lewis.